Newage Testing Instruments frequently engineers custom solutions for high volume hardness testing applications. Have a unique hardness testing application requiring specialized integration of different types of hardware and software? Need to improve the operational efficiency of your current system? 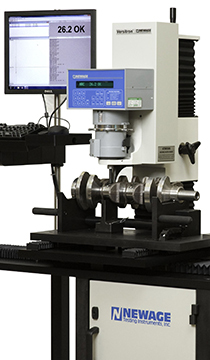 Newage Testing Instruments specializes in engineering, manufacturing and installing “turn-key”, custom hardness testing systems optimized for your samples, your location and your personnel. Whether your need is for an automated system for in-process inspection or a system incorporating special fixturing and the integration of other types of components, such as programmable logic controllers, personal computers and quality software, robotics, etc., Newage Testing Instruments has the experience and resources to ensure a proper solution for your unique application requirement. We service what we sell and can help make sure that your custom system remains in peak operational condition. Examples of semiautomatic systems indude automatic Jominy machines, automatic Rockwell scale traverse systems and in-line Brinell testers with surface preparation built-In. The basis of Newage's success has been its Rockwell, Brinell and Microhardness testers which have unique capabilities for testing accurately despite the challenges of in-line applications. Request more information to see how we can help you with a custom hardness testing solution that suits your need.